Ever been bored in a history lesson? Well matters past is depicted on the stage but with all the really horrible bits left in. 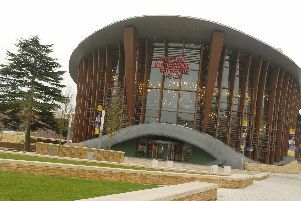 The Horrible Histories presents the Groovy Greeks and Incredible Invaders at Aylesbury’s Waterside Theatre from Tuesday June 28 to Saturday July 2. In Incredible Invaders the Celts are crunched when the Ruthless Romans invaded Britain. Can crazy Caratacus Can save the nation? Hide behind Hadrian’s Wall and witness the Savage Saxons smash their way in. Can you stop King Alfred burning his buns? Discover who’s at Sutton Hoo and survive the Vicious Vikings as they sail into the audience. It’s a thousand year journey with Incredible Invaders. Groovy Greeks takes us from savage Sparta to angry Athens to discover the truth about growing up in Greece. Take on the Trojans and pummel the Persians! Compete in the first ever Olympic Games and appear in the very first play! Meet your match with the Minotaur and be zapped by Zeus! Hold on tight as you gate-crash the gruesome and Groovy Greeks! As with their previously hugely popular Horrible Histories productions both these shows use actors and 3D Bogglevision special effects. Tickets are available from £14.65. For more information or to book tickets in advance call the box office on 084 871 7607 or visit www.atgtickets.com/aylesbury.